We had a busy weekend planed, but had no idea that we would end up visiting all three of the tracks we race at and spend about 10 hours in the truck. We started the weekend at Concept Haulers with practice so we could be ready for a race in a couple of weeks. It was the first time he had been on the track since the accident there. My biggest worry was were there any daemons left over about driving and racing at the track. He talked about the crash and his other bumps with some of the folks there but it was more story telling more then anything else. This seemed like a good thing. The day started off slow, 45 and 44 second laps, just working to remember where he was supposed to go. We did a little line adjustment on turn three to get a wider line at the entrance so he does not need to lift of the gas. At the end of the day he was in the low 43’s pretty consistently, this is about where he will need to be for the race. The next stop was a couple hours away at 4 Cycle Central in Milwaukee to get a fitting in the new kart. Regan was very helpful answering my questions and building a plan to finish the kart. While, Regan and I chatted about the things that needed to be done, Jason sat in the kart taking to us and just hanging out and getting the feel. There was a bit more work to do to finish the kart and we decided that we could meet up again on Sunday at Badger after racing at Road America. From there we drove to Plymouth, WI, where we had dinner at the bar of a really neat hotel, 52 Stafford. It had been a long drive and we where hungry and just as we had arrived the bar had just cleared by a group of 17. Having been there before we knew if we sat at the bar and order quickly we would get our dinner soon otherwise we would have to wait. A tasty order of Guinness Root Stew and a BLT where quickly before us. Our original plan was to camp at Walmart again but we where very tired and where thankful they had a room for us. This let us be relaxed and rested for racing the Sunday. We got to Road America earlyish and the driveway at the gate was packed, the Badger TAG series was racing at with the club. The first kid kart practice was just Jason and Bryce. Bryce was glued to the back of Jason looking for a way around. For the second session there were 4 kids and third practice there where 6 racers. Bryce and Jason ran in the front with Easton not far behind most of the time and Dylan, Mitchell, and Tristen still feeling their way round. This was shaping up to be a great day of Kid Kart racing. There are 4 boys in the back of the truck playing catch with a little foot ball. Between the sessions the kid kart drivers hang out together. Sometimes they just sit and talk about the races or whats going on at home or in school. Other times they run around the pit area playing games the way little boys do, even the older drivers get into their games. Football, squirreling around under the bleachers, wrestling in the grass. 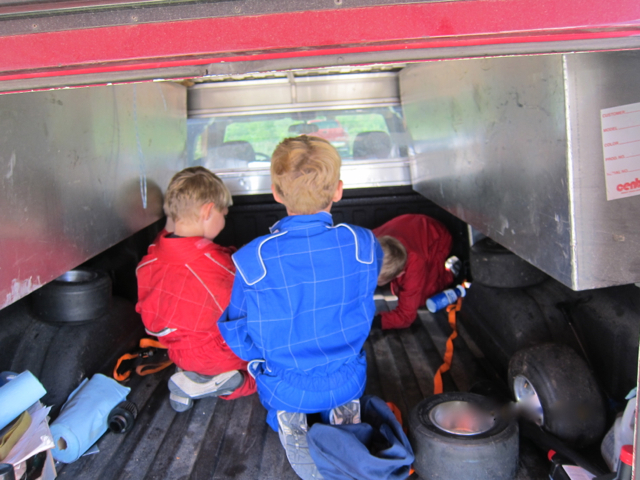 When they put their minds to it they even watch the kart racing or road racing on the big track. It is amazing to watch the friends race tooth and nail and then give high fives and thumbs up when they are done. This is the eighth race with Road America Club and I just figure out that each heat is 5 minutes and the feature race is 8 minutes. This races the first heat started out bit of a mess but in some ways it was the best. Jason was in the 4th spot, Dylan in 3rd with Mitchell in 2nd and Easton on the poll, with Tristan and Bryce in the back. The kids got all strung out during the parade lap because a couple of them where confused on how starts worked and they had to parade around again. On the second attempt they were still pretty messed up, but the green flag flew to prevent an accident. After a bit of bumping between Bryce and Jason they came into the first corner with Easton in the lead, followed by Mitchell, Dylan, Bryce, Tristan and then Jason. Oh dear. After a lap Jason made quick work of Tristan. A few laps later Bryce passes Dylan on in the first corner and then Mitchell on the next lap, while Jason is working on Dylan. Dylan almost got by Mitchelll next time around. 3 more laps go by while Bryce runs up to Easton and Jason finally gets by Dylan. On the next lap Jason tries to go low to get by Mitchell but changes to the high line at the last minute for a clean pass. Jason starts chasing the leaders again from now in 3rd place at the white flag. On the last lap he got a little hung up on the lapped Tristan but got by him just at the checker. Easton held off Bryce to the very end winning the heat. By far some of the best racing I have see from these kids. Bryce and Jason are 1 and 2 respectively for the second heat(Full Video). This is where Jason can really run. 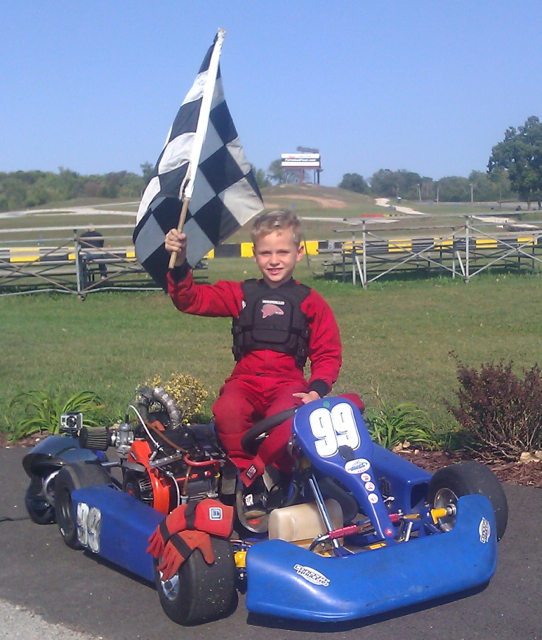 He know just how long to wait for the green flag and can get his kart spun up to grab the lead. Bryce and Jason really went at it a number of times coming out of the last corner into the straight away. A few time almost getting by but Jason held on and beat him to the first corner. It was a real nail biter to the very end, he could hear the whine of Bryce’s motor dogging him the whole time. Jason finished first and Bryce second right on Jason’s heels. The day’s kid kart feature(Full Video) race started with Jason again in the second position and Bryce on the pole. At the green Jason again stepped out front and started making space between him and Bryce. The really interesting battle was for 2nd, 3rd and 4th between Bryce, Dylan, and Easton. Most of the race Dylan worked on finding a hole in Bryce’s line. Easton managed to catch up to them and started to do the same to Dylan. All three kids ran a really clean line and did not give any quarter. At the checked flag it was Jason followed in a second or two later by Bryce, Dylan, and Easton. Another exciting race was in the books. Jason also had his personal best lap time during this race of 28.74 seconds. These kids are really starting to get very competitive and fun to watch it is too bad there is only one more race left. After packing up the truck, this time with the kid kart strapped to the roof instead of the in the bed(more on that later), we said our good byes and thank you’s and headed off to Badger to pick up the new kart. It was a very long 2 hours, karting is hard work and Jason was tired, sore, and getting leg cramps, possibly from growing too. You really need to watch these young kids as they are fine until they suddenly get really tired and stop having fun. 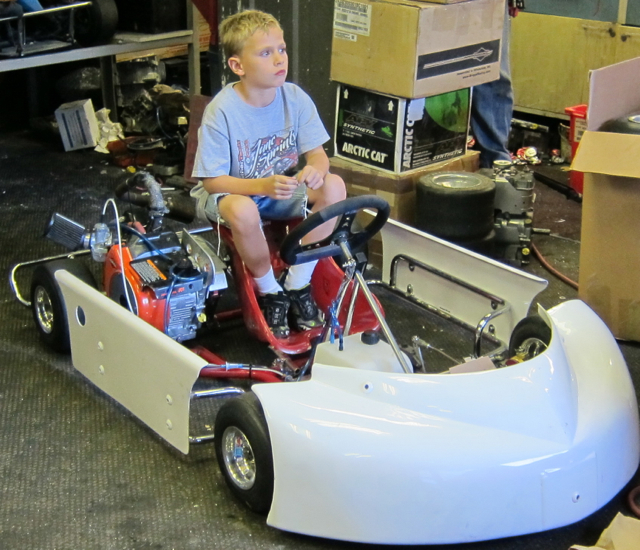 Once we got to Badger, Jason perked up when he saw his new kart and ran to sit in it again. We hung out there for a bit with the Verhings, the whole family was there, talking about how the season was going for the various clubs and tracks and plans for next year. Finally, we got Jason out the kart and the kart into the truck bed(with the little kart on the cap roof). We headed home stopping for some pizza, leg medicine for Jason, after a very long but successful weekend. The next few weeks are going to be busy. The last club race next week at Road America while we watch the SCCA National Runoffs. The week after that we are going to make second attempt at Concept Haulers on Saturday and a Badger race on Sunday. As it turns out, the race on Sunday will also be a benifit for Pink Ribbon Riders who provide direct support to people with breast cancer. If you are in the area please join us. This weeks thanks firstly go to my wife for listening to me prattle on about racing. Additional thanks goes to 52 Stafford for their good food and comfy bed and all the Verhings for helping get ready for next year. Thanks to all the folks that run the races and keep score. Congratulations to Race Director Erick on his engagement.